I love the music of 'American Aquarium' and have done since their debut 'Antique Hearts,' ten years ago. They are about as 'alt. 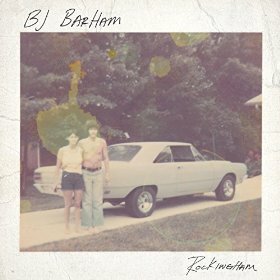 country' as that loose catchall term can possibly define and in lead singer and songwriter BJ Barham, have a man with enough gifts to also succeed as a soloist, something he achieves with this, his debut solo recording. His success in doing so was inevitable really with his vocal style that has a nice raw edge, as well as a manipulative warmth, but above all he is able to draw every last drop of emotion out of a song, at the same time drawing the listener in to the world, often dark, that he has created. Whilst this is an extraordinarily personal album, as he said himself “This is the first record I’ve ever made that’s not autobiographical—it’s fictional narrative in a very real place,” He goes on to say, “These songs are human condition stories set in my hometown, Reidsville.” The prompt for these beautifully written and arranged songs was the terrible events in Paris on November 13th 2015, whilst he and the band were on a European tour and were at that time in Belgium. The flood gates of the variety of emotions contained on this disc were prised open and within a couple of days the songs were written and awaiting recording. On his return home he played the songs to Bradley Cook, producer of American Aquariums 'Wolves,' album and they got together with Cook’s multi-instrumentalist brother Phil with Kyle Keegan on drums and American Aquariums Ryan Johnson and Whit Wright, rehearsed for two days and then recorded all eight songs in another two days! Musically, these compositions are much more sparse and have a less 'arranged' feel than the American Aquarium albums, allowing the lyrics to dominate on every song. The instrumentation is varied and whilst nothing reaches more than a sedate mid tempo that is a contributing factor that enhances the power of these eight excellent stories. They cover various aspects of the harshness that is faced by the inhabitants of a small town, some of it the shattering sadness felt by people who lose a lover, as well as the sheer desperation of trying to survive in a system for which they are ill prepared and in a situation in which there is little or no hope for the future. The album gets under way with guitar, dobro, percussion and bass before BJs wistful vocal comes in on American Tobacco Company a song that bemoans the fact that the world you perhaps fought for is not the world that greets you. Perhaps a kick at the lies we are told? That is immediately followed by Rockingham, another kick at politicians and the lot of the working man who is stuck in the same little town and yearning for something better that he knows is not going to materialize. This time the guitar, dobro, percussion and bass are supplemented by the addition of banjo and harmonica, giving a fuller sound but one that still allows the lyrics plenty of breathing space. "O' Lover is another tremendous story song that has a percussion and guitar intro before being joined by the dobro and banjo on a sad tale of a farmer not being able to make ends meet and deciding that the life of a law breaker is preferable to starvation. The song gradually takes on a fuller sound and is eventually joined by an atmospheric harmonica. On Water in the well we are treated to a piano intro that contrasts beautifully with a raw vocal from BJ, eventually joined by the banjo on a slow, moodily reflective tale of hardship, with the atmosphere enhanced by the inclusion again of a haunting steel guitar. I'm assuming that American Aquarium are still a viable proposition, in which case BJ Barham releasing solo as well as band albums provides a nice contrast in styles, something I see as a win, win situation for his ever growing band of fans! ​The album is released on 22nd July and BJ is currently touring the U.K. He will be playing at the Prince Albert, Brighton this Tuesday 19th July.